Beatrice: Just by glancing at the photo, I wouldn’t have immediately known there was a storyline to it, but I think once the viewer is informed that there is a story behind the the photo, it would be viewed in a different way, with more attention to the details in the shot. 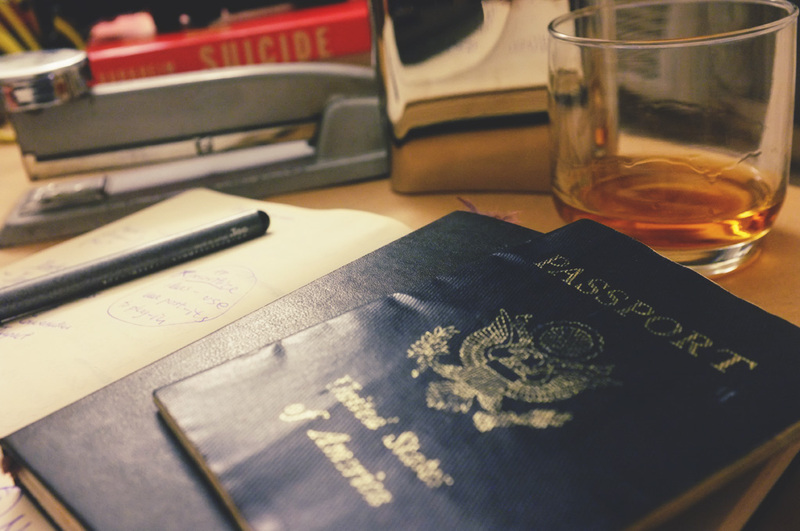 You’ve got a very interesting choice of items: the things that stand out to me are the passport, alcohol, sketchpad, and book that says “Suicide” in the background – I’m intrigued! It’s really letting my imagination run. This photo would be a great addition to a series to give it more context. It has a lot of potential! Fernando: The way you chose the objects in this picture to hint at a storyline is very interesting. I feel like there is no actual story to it; I feel it’s more like a poster for a movie or something of the sort. That aside, I think your lighting and composition are strong and interesting! Jessica: The idea that we can be represented through the things that we own definitely resound with me. Would have liked to see a stronger storyline, although I do sense a vague ‘person just returned to the States and is overloaded with work already’ kind of story coming across. Great composition, love the color scheme. Stephen: This is a compositely nice photograph, there is a lack of storyline to it and it doen’t evoke a powerful or meaningful setting. However the jakeness isn’t all to important and it does present some mystery. A development of the image in a caption may be nice to send a full story to the community. Posted in #3 - Someone Else's Story, AaronTagged aaron frey, collaborative, community, digital photography, imagination, photo blog, photographer, photography, project, project 3, somebody else's story, the photograph collectiveBookmark the permalink.